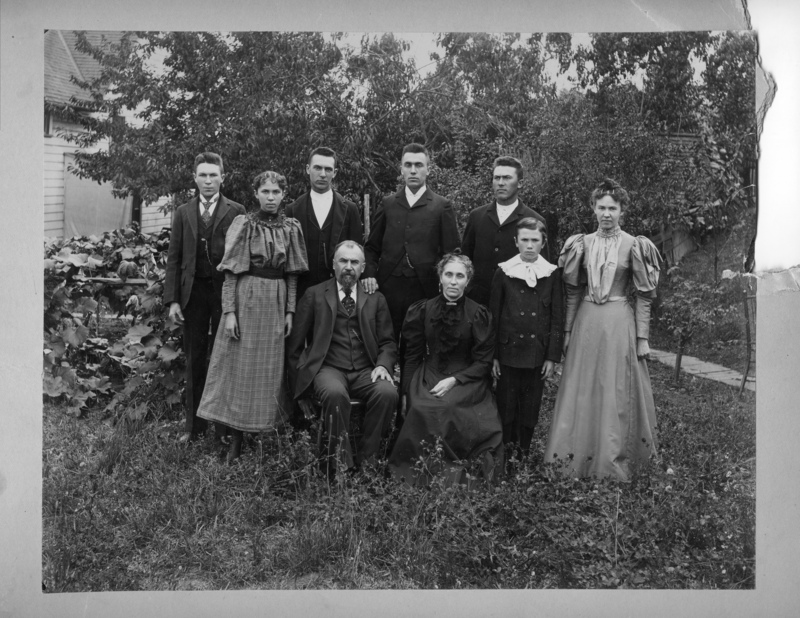 Victoria Bickner's family.---[missing], Lilly, Will (Ava's Dad), Henry, Joe, Charley, Mary, Joseph W. Bickner & Victoria. [about] 1894. (From Edith Bickner Brown) Oct 26, 1965. [Stamp]: E.L.Davidson, Oswego, Or. Description Mounted on cardboard, upper right corner missing; scanned as b & w.
Transcription Victoria Bickner's family.---[missing], Lilly, Will (Ava's Dad), Henry, Joe, Charley, Mary, Joseph W. Bickner & Victoria. [about] 1894. (From Edith Bickner Brown) Oct 26, 1965. [Stamp]: E.L.Davidson, Oswego, Or. Physical Description H 10" x W 12"